Most people already associate Summer with fun – but with a brand new iPad courtesy of Wheels To Lease’s latest contest, Ely Katz is having more fun than most. 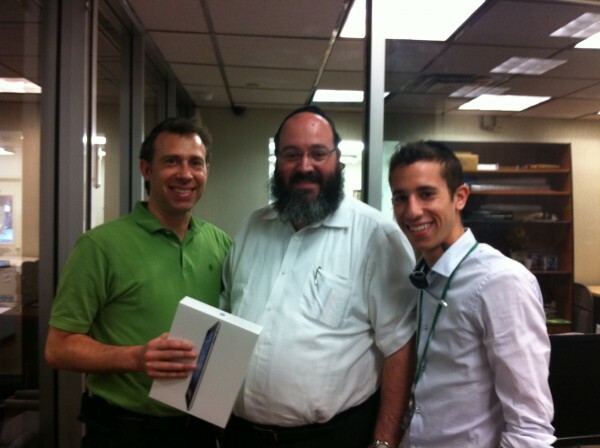 The contest was part of Wheels To Lease’s Year of Giveaways – a celebration of their 20 years of serving the Jewish community with unbeatable prices and exceptional customer service. “We’ve been in businesses for over two decades, and I felt like it was a good time to give back to the community who have been loyal to us for all these years,” said CEO Shlomie Hershkop. “And what can be more fun than giving away iPads?” This is their third iPad they’ve given away this year – in addition to Amex giftcards, comedy show and Mets ticket, not to mention free cars. Wheels To Lease is currently running another iPad contest, scheduled to be raffled off on August 31st. “Giving away cool prizes is fun!” said Hershkop. “We just can’t get enough of it.” To enter the contest, simply head over to the Wheels To Lease website at www.wheelstolease.com/joinemaillist, and like their page on Facebook:www.facebook.com/wheels2lease. Already on the Wheels To Lease email list? Great! You’ll be automatically entered into the contest. Join the Wheels To Lease Facebook page to be the first to know about other great giveaways like this at www.facebook.com/wheels2lease. Wheels To Lease has been serving the Jewish community for over two decades, providing top of the line cars at the best possible prices. With their exceptional customer service, they are proud to call 30,000 families their loyal customers. For more info on Wheels To Lease, visit www.wheelstolease.com or call (718) 871 – 7749.